It get's here tomorrow before 2:45pm according to UPS so I'll report back once it arrives. If it ends up being too heavy, they are starting to show up at Sweetwater with posted weights. I got the email notice from Sweetwater that they were in stock. I will definitely go that route if the one coming today is too heavy. (edit: guitars already gone at Sweetwater) The key is timing. Looks like Chicago Music Exchange has a couple in stock as well. Curious, I noticed that one of the pink shell Mustangs at Sweetwater has a special edition sticker on the back of the headstock and one doesn't. My Fender Capri Orange Mustang Bass PJ has that sticker on the back of its headstock too. The two at Sweetwater seem to have sold already. As far as the Special Edition sticker. I talked to Fender about it and it appears that the Shell Pink was initially going to be a FSR / Special Edition color but is now available to any retailer and the color is shown on the Fender website. There's no difference between the guitars with or without the sticker. I bought one of the new Shell Pink Mustangs intending to swap necks with my Capri Orange Duo-Sonic so that I would have a Shell Pink Mustang with a Maple fretboard and spaghetti logo but I love this Pao Ferro fretboard so much I'm having second thoughts about any permanent change. I'll probably do it eventually but not immediately like I had planned. Here are some more pics from my NGD. 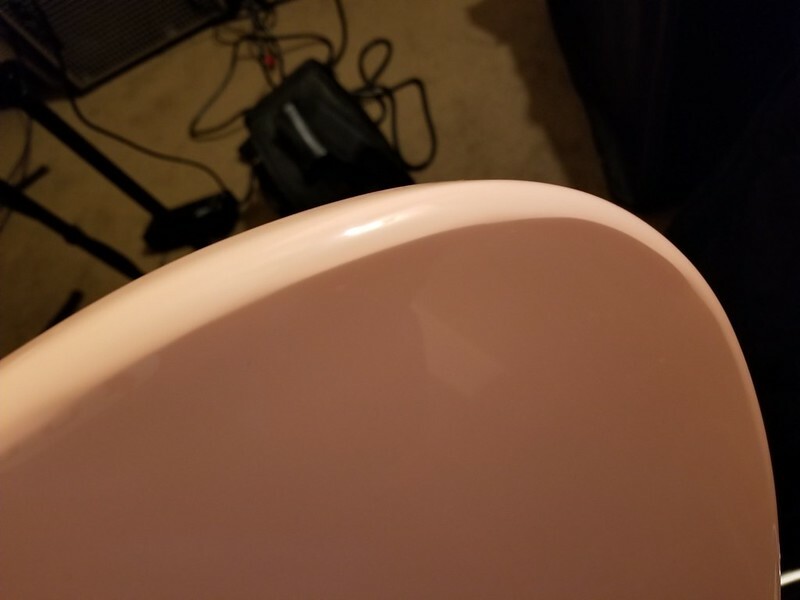 Has anyone had success aging a pearl pickguard, and how did ya do it? I got it. It WAS double boxed. 7lb 3.8oz. The weight is mostly in the body, kinda like a tele. Disappointed in the quality though. The switch causes the output to go in and out. 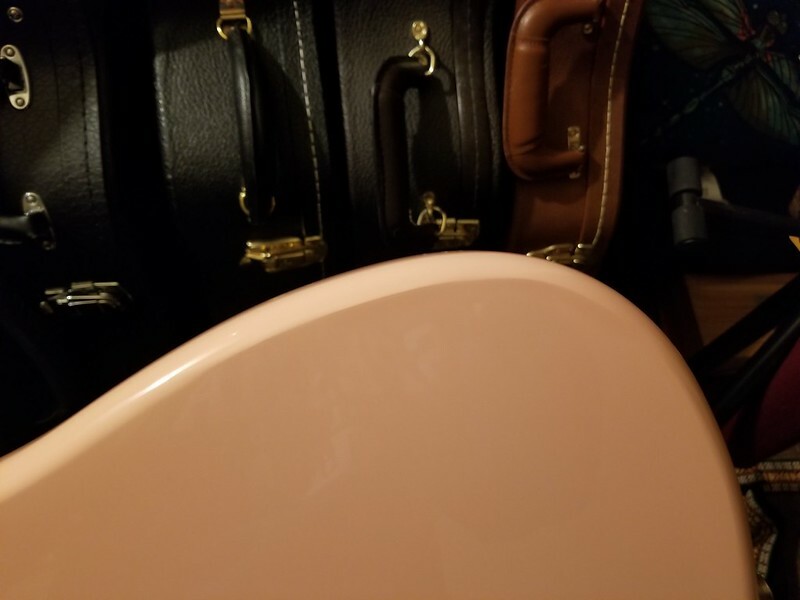 There was a crack in the finish on the neck, there was a black wax pencil mark on the top horn and small black specs in different areas of the top and back of the guitar. The biggest issue though was that part of the back top bout was not sanded to a curve. I'm pretty sure this was a second. I wiped off the black wax pencil mark, I used 0000 steel wool to smooth out the finish crack and also to remove the black specs that I saw. The switch can be changed, but that lack of sanding the body correctly really bugs me! The pickups sound good, the neck feels good. Since it isn't a special edition anymore I'll send this back and wait for one that was built correctly. Here is what the bout that wasn't properly sanded looks like. It is a hard edge, not smooth at all. Yikes, that sanding/shaping is terrible. I'd return it too. You can fix the MIM switch problems with a little bit of CAIG but I typically just put a new and better quality switch in them. Good luck on the next one if you decide to get another one. I think you should be able to see any sanding / finish anomalies in the sweetwater photos and find a nice light one. Wow. I had heard that these have some QC issues, but that should never have left the factory. Seems it's still Squier > MIM Fender. I didn't realize the Mexico QC issues were widespread. With Fender I'm usually buying American or Chinese. 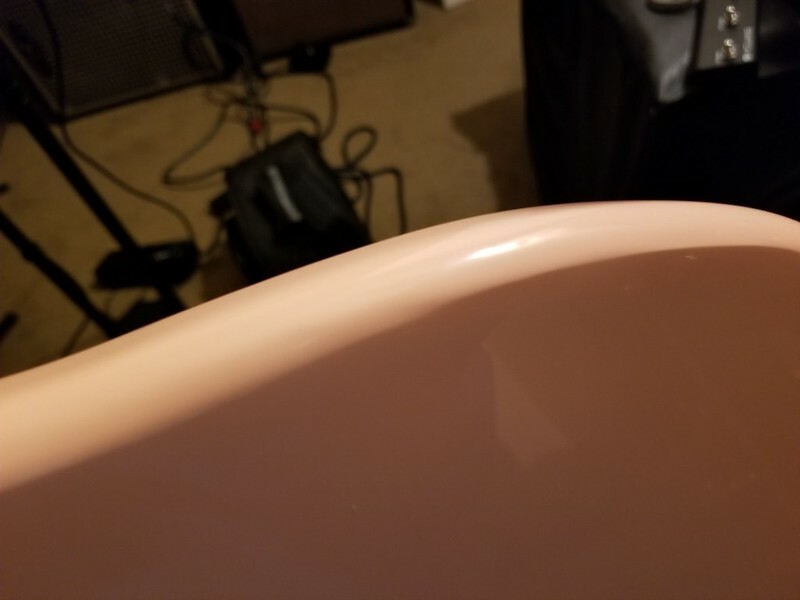 I recently I bought a Torino Red Mustang Bass PJ (Mexico) from Sweetwater and it had a crack in the fingerboard so it was sent back. Everything else was fine. I ended up with a Capri Orange replacement and it has no issues. I have a Squier Classic Vibe 60's Strat and it is absolutely wonderful. I've had other Squiers from the Classic Vibe series and all have been very nice. I was surprised that a body in this shape got out the door as well. I haven't made up my mind on whether I will go for an exchange or refund yet. I don't think all MIM models have QC problems, I had only read that the new offsets do. The ones I've played in Guitar Center weren't terrible, but some had sharp fret ends and scratchy pots. since I bought it at a guitar center I brought it back and the guitar tech fixed everything in a few minutes-- the switch is good it just needed to be cleaned out I guess there was some sawdust or something in it. and one of bridge saddles had to be replaced. I've had really good luck with MIM QC. The selector switch on my Orange MIM Duo-Sonic needed a little squirt of CAIG but has worked flawlessly ever since I re-strung it on the first day which has been over a year now. I have a few MIMs including a Road Worn 50's Strat that I think is fantastic and have had no issues. So I decided to do an exchange with MF, I do want the guitar and seriously I wouldn't be able to get this kind of discount anywhere else - that backstage cash back adds up. I got a 17% coupon from MF in my email today so they applied that. After using the backstage cash it was $130 out of pocket. So now looking forward to a better replacement and hoping they don't send this guitar to anyone else. The second one is on its way! The weight is the same 12.7lbs - I hope they aren't sending me the one I returned I wouldn't put it past Musician's Friend. Good luck! I hope you get a 6 pound 8 ounce guitar with properly sanded contours. I'm getting ready to do the neck swap on my pair (Mustang / Duo-Sonic). Well, I got my replacement today and it's 6lbs 15oz. Everything looks good. No flaws. Won't get a chance to set it up until the weekend. Will do a NGD and NBD together with the Mustang PJ bass. because I liked the the Pao Ferro fretboard so much. I�m really glad I did it. I think both guitars benefit from the change. Wow that maple fingerboard with the pink shell is very nice. Have you thought about swapping the pickup covers? 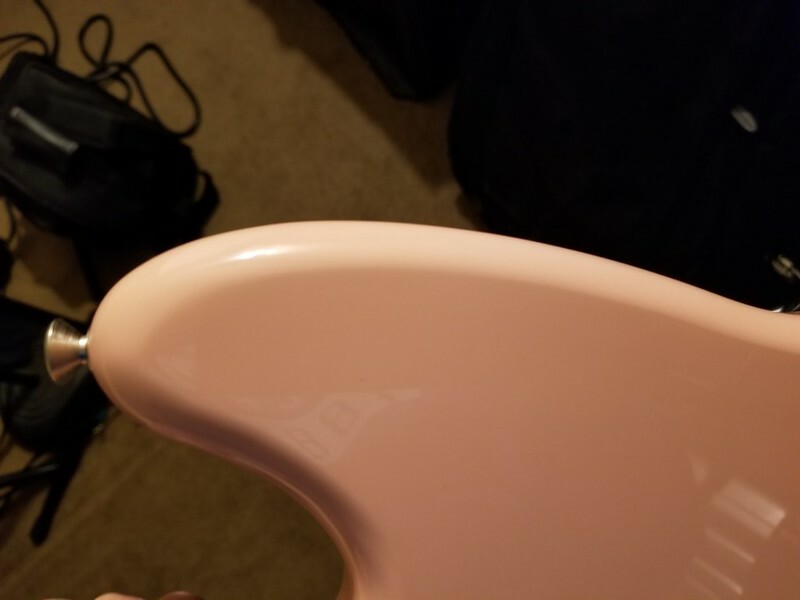 I did that today when I had them apart but the white covers were "too white" for the aged pickguard on the Shell Pink Mustang and the black ones didn't look great on the Capri DS so I left them for now. I should have taken a pic. I will find some slightly aged white covers for the next time I change the strings on the Shell Pink one. I would like to know. How is the tuning stability with light gauge strings? I have a few cheaper short-scale guitars that play wonderfull and sound great. 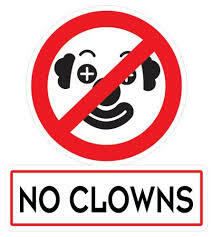 But they become out of tune very easily. So before I spent 550 euros on another guitar I appriciate your advice on this.